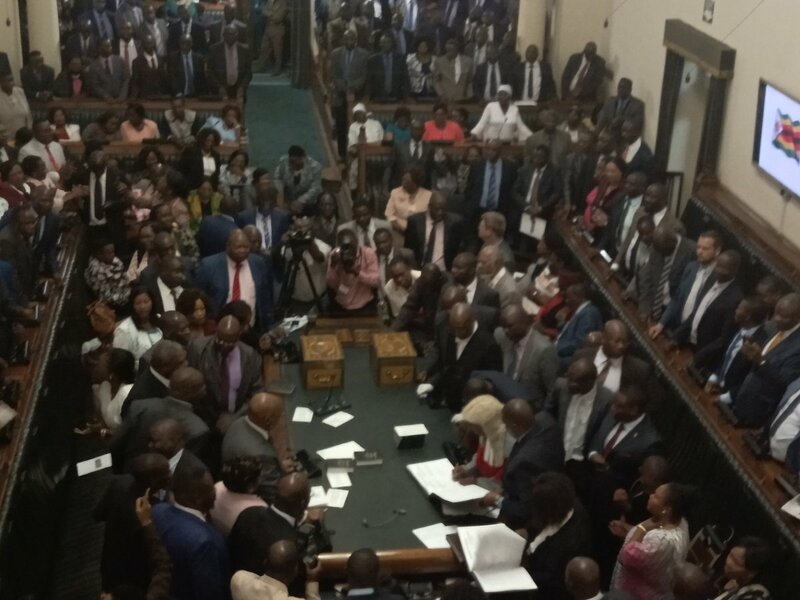 THERE was drama in the National Assembly yesterday as opposition MDC Alliance legislators heckled and booed Chief Justice Luke Malaba, calling him a “thief” after he entered the House to swear in returning Speaker Jacob Mudenda and other presiding officers. Zimbabwe Electoral Commission (Zec) chairperson Justice Priscilla Chigumba, who was in attendance in the National Assembly, suffered the same fate until she was whisked out of Parliament by deputy Clerk of Parliament, Hellen Dingani. Malaba led a full Constitutional Court bench that unanimously ruled against a petition brought by MDC Alliance leader and presidential candidate in the July 30 election, Nelson Chamisa, and confirmed President Emmerson Mnangagwa’s victory. When he entered the House clad in his full judicial robes for the swearing-in ceremony, MDC Alliance MPs burst into song, attacking the country’s top judge, while Zanu PF MPs hit back by shouting “ED Pfee”. Malaba was visibly shaken. Mudenda was retained as Speaker, with Tsitsi Gezi elected as his deputy in elections conducted by Zec. The ruling Zanu PF party has 180 MPs in the National Assembly, while the MDC Alliance has 88 MPs. Both independent MP Temba Mliswa (Norton) and NPF legislator Masango Matambanadzo (Kwekwe Central) voted for Mudenda. In his acceptance speech, Mudenda urged MPs to unite and work together. “The most important thing is that, through our committee system, we should be able to build consensus and build Zimbabwe,” he said. Newly-appointed MDC Alliance chief whip Prosper Mutseyami congratulated Mudenda, but pointed out that they would continue protesting over Malaba’s handling of the election petition. Meanwhile, Mabel Chinomona was voted Senate President, with Michael Nyambuya deputising her in an election presided over by Clerk of Parliament Kennedy Chokuda and Zec. The drama in the National Assembly started when Chegutu West MP Dextor Nduna (Zanu PF) stood up to nominate Mudenda as Speaker. He was heckled by MDC Alliance MPs, who shouted that Nduna was a fraud who had stolen the Chegutu West elections. Harare East MP Tendai Biti then nominated Mpariwa. Biti later told NewsDay that they had nominated Mpariwa for Speaker even though they knew that Zanu PF would win because they had the numbers. Similar ructions were experienced in the election of the deputy Speaker when Tsitsi Gezi (wife of the late Border Gezi) was nominated by Mberengwa North MP Tafanana Zhou. Gezi holds Bachelor of Science in Agriculture and Master of Business Administration degrees. Biti then nominated Harare Central MP Murisi Zwizwai, whom he said holds a PhD in security studies and Master of Science degree in Peace, Policy and Governance from Africa University. Zwizwai was also a war veteran who fought alongside Defence minister Oppah Muchinguri at Manyika Front.